STV has reported a rise in revenues and underlying profits for the first half the year. The broadcaster said total revenue rose year-on-year by 6%, to £57.7m, following growth across its broadcast, digital and production divisions. It made an operating profit of £10m but slipped to a loss of £4.3m, largely due to costs of about £8m relating to the disposal of loss-making channel STV2. 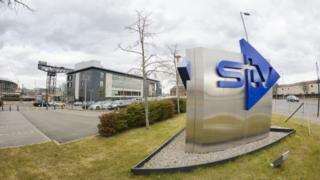 STV said it was "making excellent progress" with strategic growth plans. Those plans included ditching STV2 and restructuring its news operation. In its results statement, STV said it had recorded its strongest share of viewing since 2009 at 18.7% - 13% higher than the same period last year. National revenue for its broadcast division was up by 2%. Its figures were boosted by the Fifa World Cup, which helped revenues rise year-on-year by 23% in June. In its digital arm, online viewing on the STV Player climbed by 73%. STV Productions' revenues were up by 42%, although the division recorded an operating loss of £1.2m, compared with a £1.4m loss in the first half of 2017. The broadcaster expects production revenues to be up by more than 50% for the full year, with growth driven mainly by delivery of a new four-part drama, The Victim, for BBC1. Looking ahead, STV said it expected "momentum in advertising markets" to continue in the third quarter. Chief executive Simon Pitts said: "The results announced today show encouraging underlying growth across all of our key business areas so far in 2018, which we expect to continue for the remainder of the year." The strategic review of STV's operations and news output was announced after Mr Pitts joined the STV board in January. In May he announced that STV2 - which was launched in 2017 to bring together STV's regional TV stations - would close down after losing £800,000 in its first year. On Monday, the broadcaster announced that it had signed a four-year strategic partnership with Virgin Media, which will give Virgin TV customers in Scotland access to fully regionalised versions of STV in HD for the first time.